It is with great pleasure that we invite you to participate in the 5th NHRD HR Showcase 2016, as part of the NHRD National Conference to be held at Grand Castle, Palace Grounds, Bellary Road, Bangalore, on 8th and 9th December, 2016. 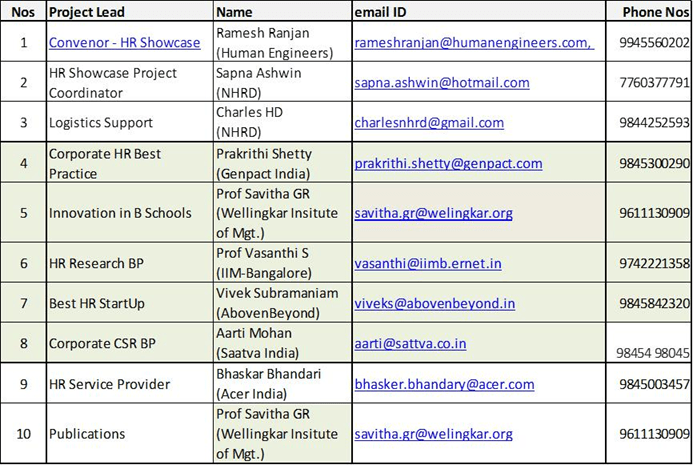 The NHRD HR Showcase, as you know, is a signature event of the NHRD Bangalore Chapter, and is shaped to bolster the enduring spirit of the HR practices. You can glance and (in all probability) be infected by the vibrancy and enthusiasm coursing through the events of the past….. In the true sense of the word, we intend to make the Showcase a platform to present HR excellence, spanning a range of unique sensibilities, from an intellectual re-imagining of concepts and cultures to an intuitive adaptability for significant business impact. This Showcase would be an opportunity to honour the thinkers and doers among us, the barrier breakers, the bridge builders, and the radiating forces of change. We intend to seat them under the limelight. We hope you present yourself and your path-changing practices as a formative influence to the rest of us. If you have an impressive body of work, please feel free to submit multiple applications for various Best Practices that you have initiated and implemented. Submissions are completely free. To participate in this exciting event, you may apply online at http://www.hrshowcase.in. You may submit multiple applications for various Best Practice that you have initiated and implemented. The last date to submit your application is 15th October 2016. We look forward to your participation and sharing your Best HR Practice !!! Dont wait for the last day, send in your entries as soon as possible. If you need any further clarifications, pl. feel free to reach out to the Program Managers as listed above.